Richard Cheston watches Marjorie Prime, a science-fiction film written and directed by Michael Almereyda. At some unspecified time in the future Marjorie (Lois Smith) is an 80-year-old widow living with dementia. Her daughter Tess (Gena Davis) and John, her son-in-law (Tim Robbins), arrange for a holographic representation of her husband, Walter, to be present in their house. The version of Walter Prime (Jon Hamm) that Marjorie chooses is of Walter when he was a much younger man. The intention is that Walter Prime will comfort Marjorie, in much the same way that simulated presence therapy or the video or audio recordings from an attachment figure are currently used in dementia care. In order for the computerised Walter Prime to learn more about the real Walter, so he/it must be told stories – by Marjorie and by John, as Tess refuses to see the re-animated version of her father. In this way, through these confused, sometimes contradictory memories, we slowly learn about the historical Walter. We also learn about Walter’s relationship with Marjorie and about the secrets in their life – and how the suppression of emotion and memories ripples through time and across generations. While the context for the story is Marjorie’s dementia, this is a film that is more about the re-membering of the autobiographical past than it is about Marjorie’s struggle to recall the recent past. Its focus is on memory and relationships rather than the day-to-day business of living alongside Alzheimer’s disease: it is about the repression of trauma rather than the stress of caregiving. The hologram of Walter is not, from the point of view of dementia care, especially relevant – it is, in essence, a plot device around which the lives of the remaining members of the family can evolve. Marjorie Prime is a quiet film with understated performances that allow the underlying despair of this family to be gradually revealed. Its power comes from the slow, measured pace at which the characters and the sadness of their lives are revealed. The small cast are excellent: Jon Hamm’s Walter Prime is enquiring but unemotional and complements the equally unemotional, but puzzled and forgetful, Marjorie and the uncertain Tess. It is sparse and concentrated, but also a rewarding experience. 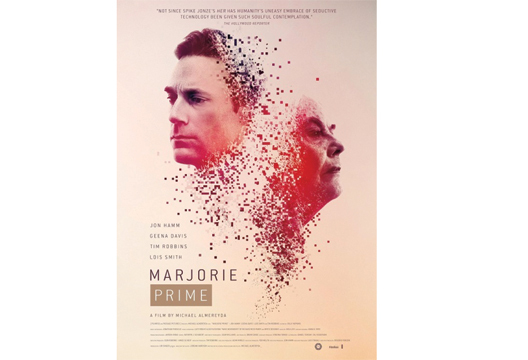 Although not the traditional science fiction film, Marjorie Prime nevertheless raises thought-provoking questions about the nature of identity and the self-protective nature of forgetfulness.